The Round Ireland Yacht Race organisers are excited to announce the inclusion of a separate multihull class for the 2016 race. This will be the first time that multihulls have been invited to compete. One of the first multihulls to express interest is from Team Concise. Ned Collier- Wakefield, Team Director and Skipper for Team Concise, has indicated that they intend entering their three boats into the 2016 Round Ireland – the MOD 70 and their two Class 40 boats. The multihull yachts will compete against one another for a new race trophy and course record. 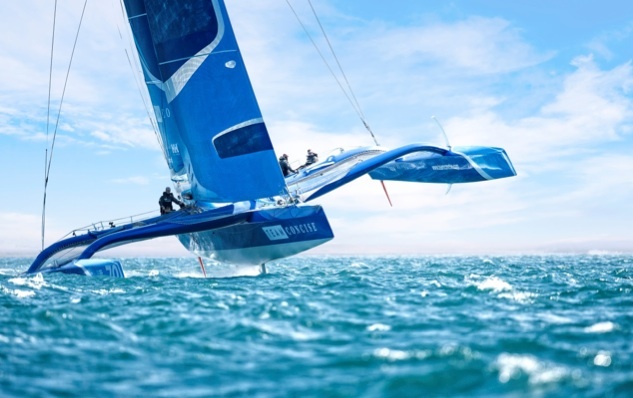 In May of this year, the Omani trimaran Musandam-Oman Sail set a new record for the circumnavigation of the island of Ireland by sail – 1 day 16 hours 51 minutes and 57 seconds – but this was not in a race setting. The Round Ireland race record (for monohulls) is held by Mike Slade who completed the race in 2 days 17 hours 48 minutes 47 seconds in ICAP Leopard 3 in 2008. Wicklow Sailing Club organises the Round Ireland Yacht Race under the auspices of the Royal Ocean Racing Club. As in 2014, the 2016 race is being jointly hosted with the Royal Irish Yacht Club in Dun Laoghaire. This association with the Royal Irish ensures that there will be ample space for larger monohulls and now also multihulls which wish to compete in the race. Race organisers in Wicklow are also in contact with the Multihull Offshore Cruising and Racing Association. The organisation welcomes this development and a number of boats have already expressed interest in competing in the race. In an additional development, the race organisers are introducing another new trophy which will be awarded for the best sailing school boat on corrected time. The Round Ireland is a popular race with sailing schools and this new trophy means that they can compete against each other in a more meaningful way. The race officially opens for entries in January 2016 but expressions of interest are welcome at the email address below.